Each Tablet contains Daclatasvir Dihydrochloride INN equivalent to Daclatasvir 60 mg.
Daclatasvir is a potent and specific inhibitor of the HCV NS5A replication complex. The HCV NS5A is a multifunctional protein with key functions in HCV replication and modulation of cellular signaling pathways. 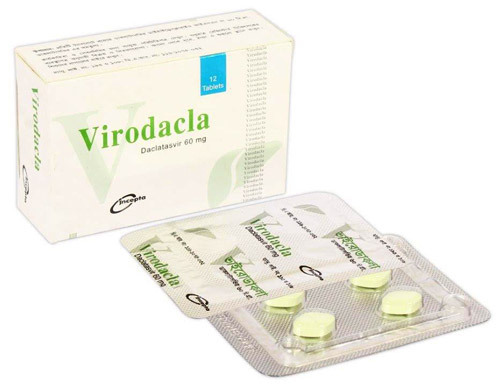 Daclatasvir is indicated in combination with Sofosbuvir for the treatment of chronic hepatitis C virus (HCV) infection in adults. The recommended dose of Daclatasvir is 60 mg once daily, to be taken orally with or without meals. 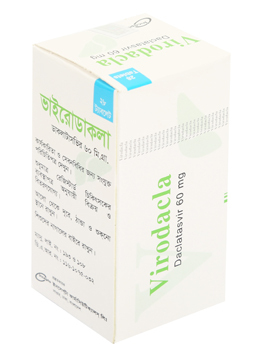 Daclatasvir must be administered in combination with other medicinal products. The dose of Ribavirin, when combined with Daclatasvir, is weight-based (1000 or 1200 mg in patients <75 kg or ≥75 kg, respectively). The most frequently reported adverse reactions were fatigue, headache, pruritus, insomnia, influenza-like illness, dry skin, nausea, decreased appetite, alopecia, rash, asthenia, irritability, myalgia, anaemia, pyrexia, cough, dyspnoea, neutropenia, diarrhoea and arthralgia. The most frequently reported adverse reactions (frequency of 1% or greater) were neutropenia, anaemia and lymphopenia. The safety profile of daclatasvir in combination with Peginterferon alfa and Ribavirin was similar to that seen with Peginterferon alfa and Ribavirin alone, including among patients with cirrhosis. of amiodarone with Sofobuvir in combination with Daclatasvir is not recommended. Daclatasvir should not be used during pregnancy or in women of childbearing potential not using contraception. Use of highly effective contraception should be continued for 5 weeks after completion of Daclatasvir therapy. It is not known whether daclatasvir is excreted in human milk.